I love craftsmanship. I grew up watching Norm Abram turn carpentry into magic on "This Old House" and "The New Yankee Workshop," and witnessing my dad and his friends try to use some of the same tricks on our own homes. Around the same time, I would spend hours in our basement, sticking an assortment of copper pipe-fittings together like Legos, pulling them apart, and then doing it all over again. I would sometimes wonder if maybe, just maybe, Dad might show me how to solder them together like I had seen done on TV, so that water might finally flow through my contorted masterpiece. So it was touching and slightly upsetting when I read Mike Rowe's testimony before the Senate Committee on Commerce, Science and Transportation. The crux of his argument was that America's single-minded fixation on four-year college educations has created a stigma for educational paths leading toward skilled workmanship. So with that said, here are a few of the under-appreciated craftsmen of our world. Office construction. At times, the floors literally move beneath you while you're trying to get things done. I was amazed at how thoroughly and efficiently these workers were able to build a tunnel of plastic one evening to contain the dust as they removed temporary walls from the building. 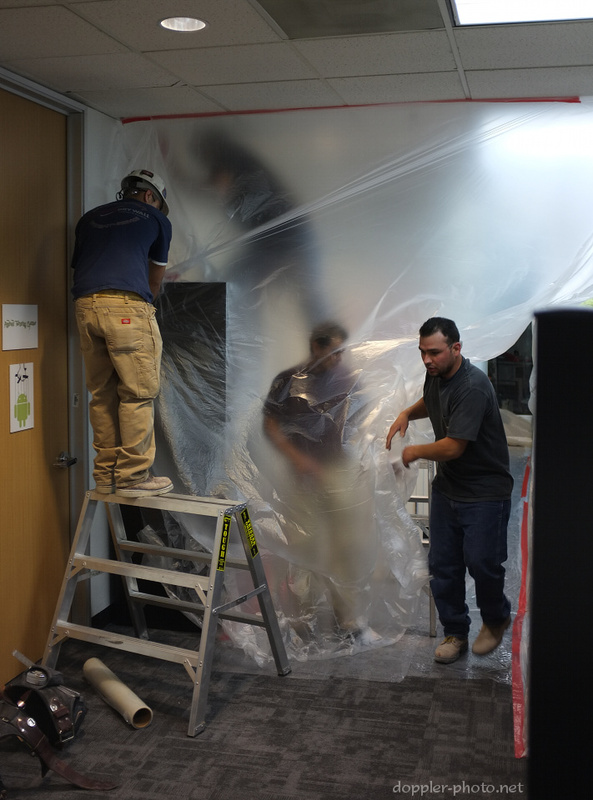 The teamwork was also impressive: two people did the tape on the ceiling, while another two maneuvered the large plastic sheet into place. In the picture above, they were working to seal the edges with tape to prevent dust from leaking past the sides. 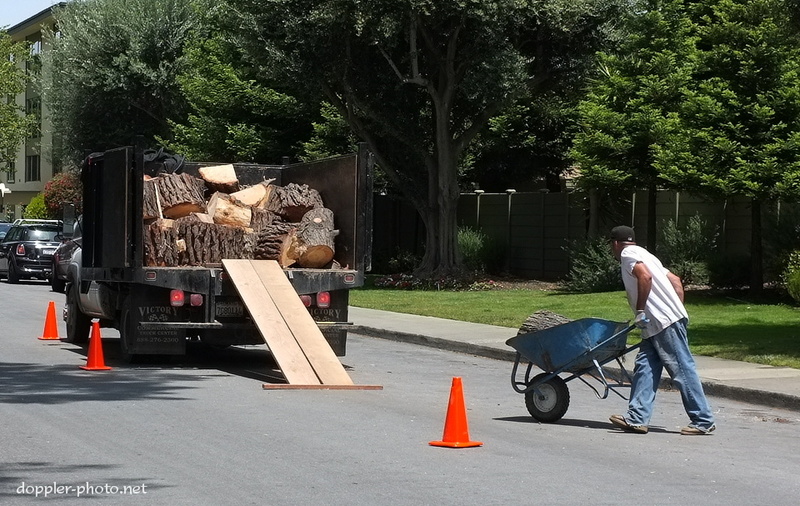 Here, a man prepares to run a section of a tree stump into a truck bed to be hauled away. If hauling heavy objects with a wheelbarrow were like to learning to ride a bicycle, this might be akin to carving corners on a steep descent — once you know what you're doing, it's reasonably straightforward, but it can take a lot of practice and confidence to be able to do it consistently. 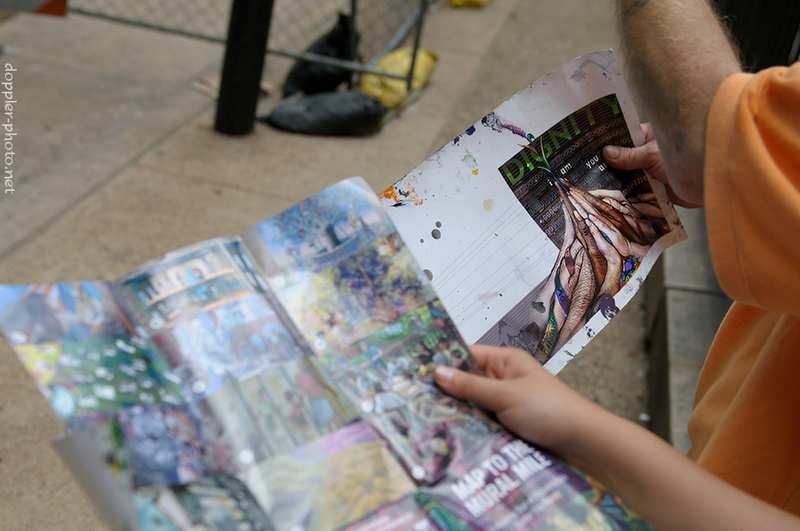 John (far right), a homeless person, points as he explains part of the design for a mural he's working on, "Finding Home." Though still under construction when I took this photo last June, the mural was already listed as the fourth stop on Philadelphia's Mural Mile. Unlike the other murals on the list, however, John mentioned that many of the people helping to construct this one were homeless, and that the mural sat in an alleyway leading to one of the city's homeless shelters.